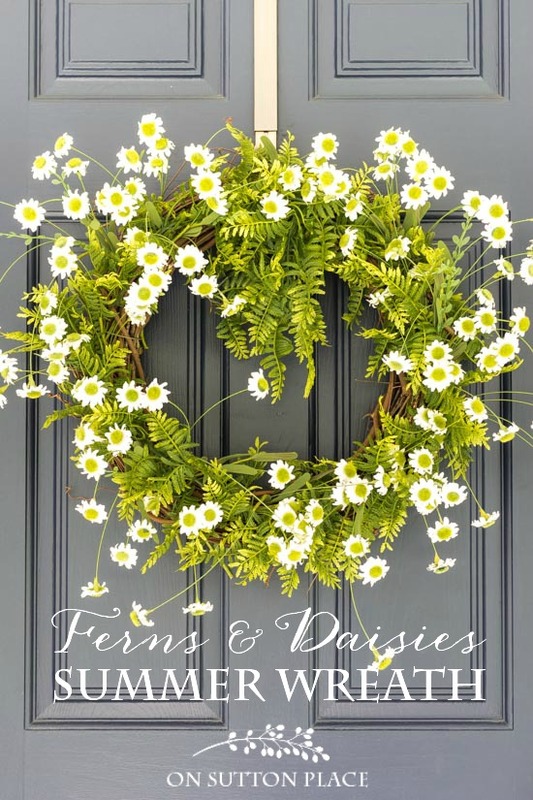 DIY easy fern & daisy summer wreath. Works on any color door! Welcome to Part 2 of my summer front porch! I sort of skipped over spring because of everything that was going on with my living and dining room makeover project. I did share a tulip wreath several weeks ago but that’s as far as I got. 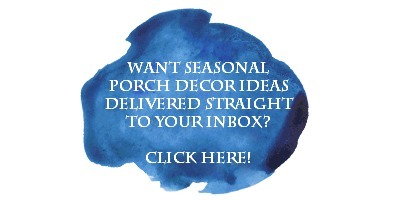 So I’m making up for it now with a fresh and easy plan for your porch decor that will take you all the way until fall. 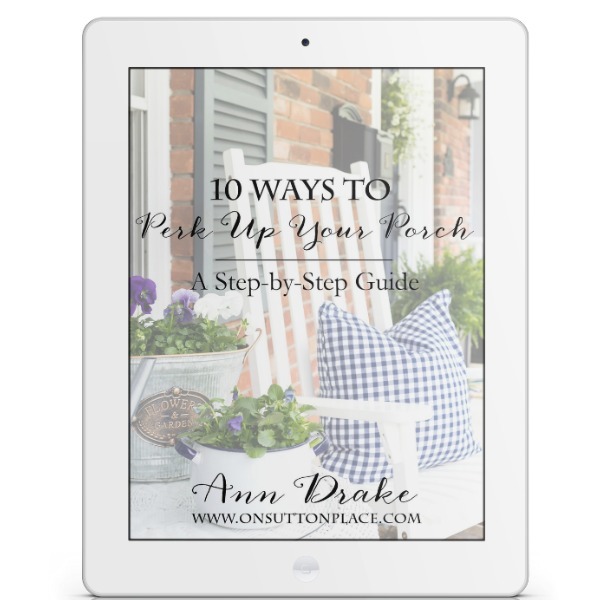 I already showed you how to make The Easiest Porch Planters Ever. The next step is the door wreath. Sometimes I plan things and they work out beautifully…and other times not so much. 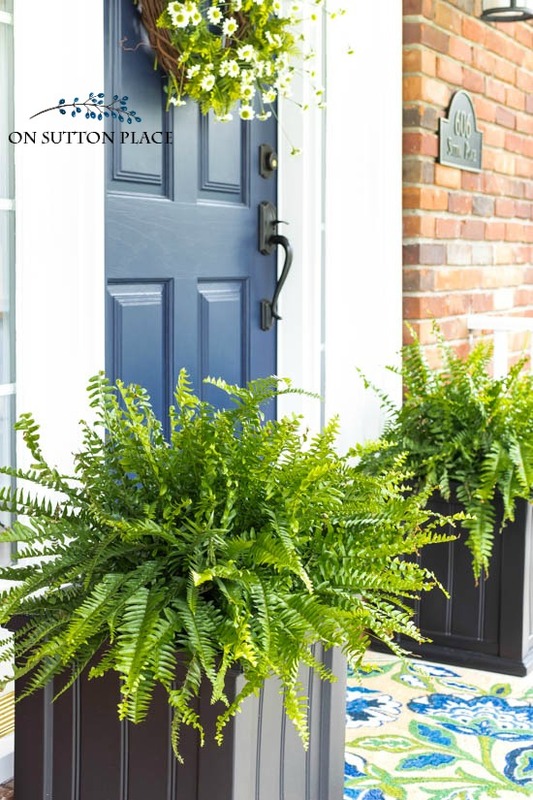 I had a vision of a simple fern wreath to complement the ferns in the planter boxes. 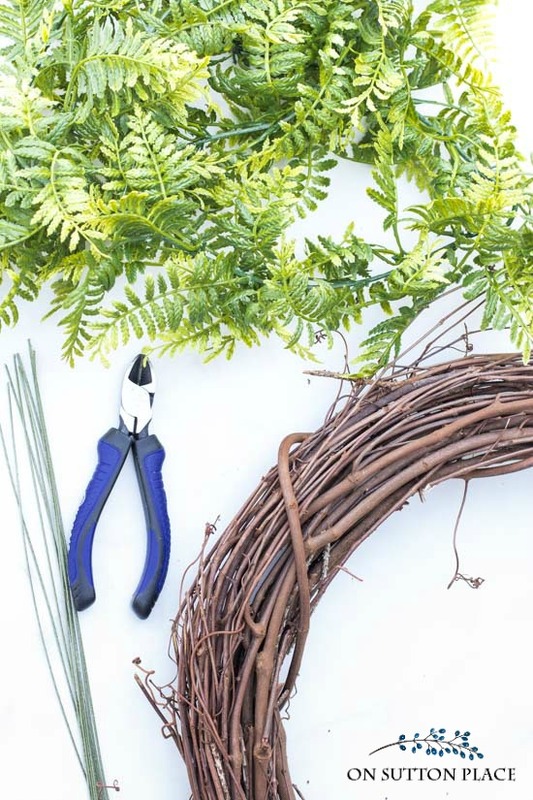 I didn’t want a big wreath that would steal the show so I started out with an 18-inch grapevine wreath, fern garland, wire cutters and wire. Not bad I thought…but not great either. I decided to put it on the door and go from there. The minute I hung it up, I knew it needed something. Another layer of ferns? A bow? I really wasn’t sure until I remembered that I had picked up some daisy bushes at a local shop but hadn’t done anything with them yet. I sat on the porch and cut the bushes apart so I had a big pile of daisy stems. Then I stood in front of the door and randomly stuck them in the wreath, one at a time. They sort of bob around and instantly gave the wreath a full and three-dimensional look. For not really knowing what I was doing, this fern & daisy summer wreath turned out to be one of my all-time favorites. It shows up great from the street and is a fun addition to the porch. Now I can check planters, doormat and door wreath off my list of things to do. Still to come is the sitting area with pillows and accessories. Here is a preview of the sitting area. It was so stark and bare from the winter, but it perked right up with the addition of some color and plants. Stay tuned. 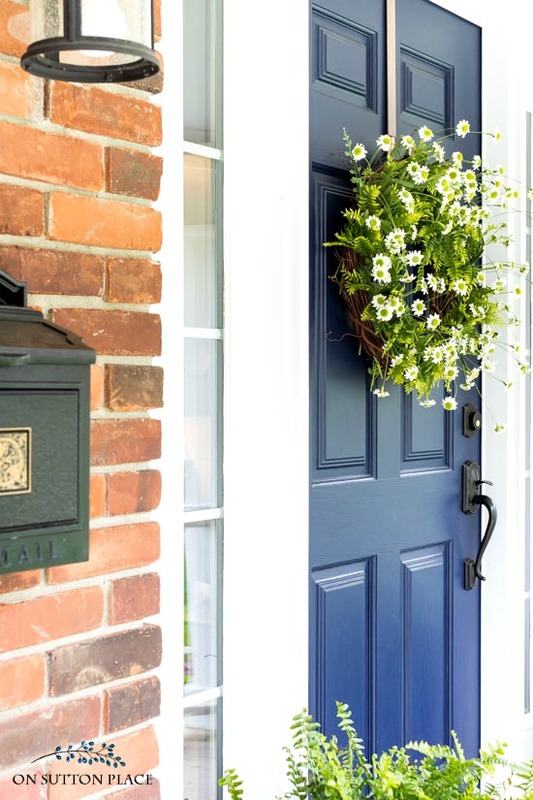 Doormat | Black planter boxes | Mailbox | Porch lights | Address plaque | Fern Garland | Daisy bush (similar) | My favorite wire cutters | Wreath hanger | Door color | Ferns were purchased at Lowe’s. For another style of DIY Daisy Wreath click HERE. I’m making progress on my makeover but it’s slow. The window treatments were holding me up but I think I’ve finally made a decision. Now to make it happen! I hope you have a lovely week…and if you need to “make something happen,” I hope it all goes smoothly. « Living & Dining Room Makeover | Hardwood Floors Are Finished! Anne, is your front door navy? What about your shutters? My door is red and I want a change. Lovely! I can do it! Lovely! I have a wreath and I love the Daisies just randomly placed! Love the wreath! Seems simple to make, I think I will try to make one myself. Thank you for the inspiration! Love the wreath..so pretty and fresh for Spring. Your porch is always one of my favorites for every season! If love this look the daisy like flowers are so cheerful remind me of my daughter Meredith who died of cancer nine years ago they were here favorite flower,she used them in her wedding She was a 4th grade teacher we planted daisies at her school after she went to heaven! 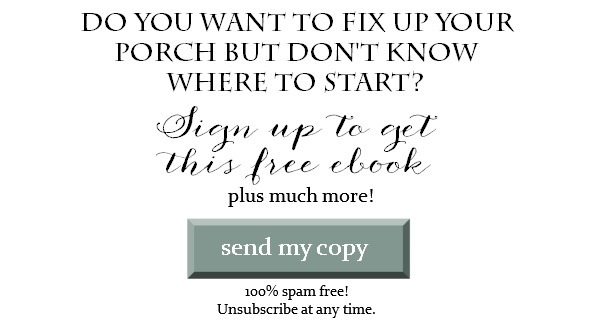 Thanks… You are my go to for ideas! I love all of your fun projects! I love it!! So pretty & simple, but stands out. And I’m glad you have a link as to where you got your supplies for this adorable wreath. I never thought of Hobby Lobby for the fern garland!! Thanks again! Your wreath looks quite welcoming and because those daisys keep moving in the breeze, it actually looks real. It compliments your dark colored door, also. Good job! I love this wreath! It is happy and definetly welcoming! Thanks for this inspiration! Absolutely beautiful! What a happy looking wreath. I may need to attempt this one. Beautiful, as always! I wish I could be your neighbor, right across the street so I could always look over! Very eye catching! Just beautiful! Ann! Only you could just start “laying some stuff’ around on a grapevine wreath base and accidentally create something this beautiful!! I have made so many of your wreaths and loved every one, but I know I cannot possibly come close to this. The tutorial is stuck in your creative mind and even you didn’t know it was there. 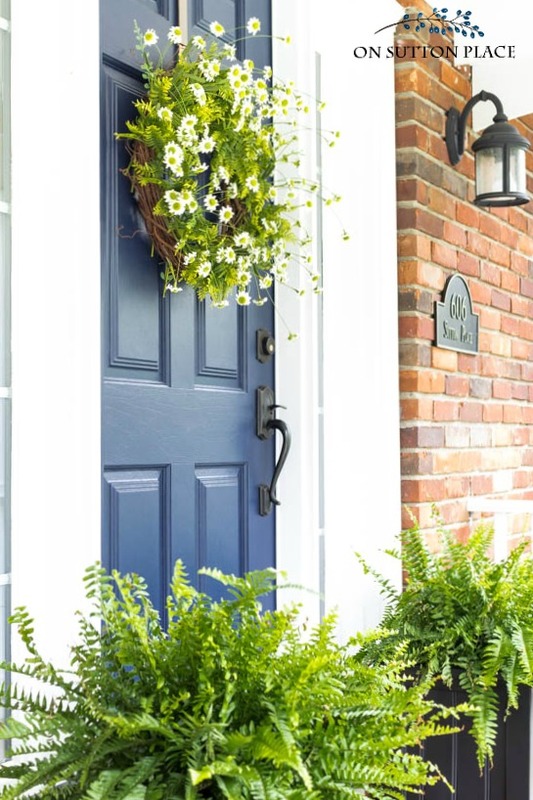 I love the colors and the way they place off your great front door color. 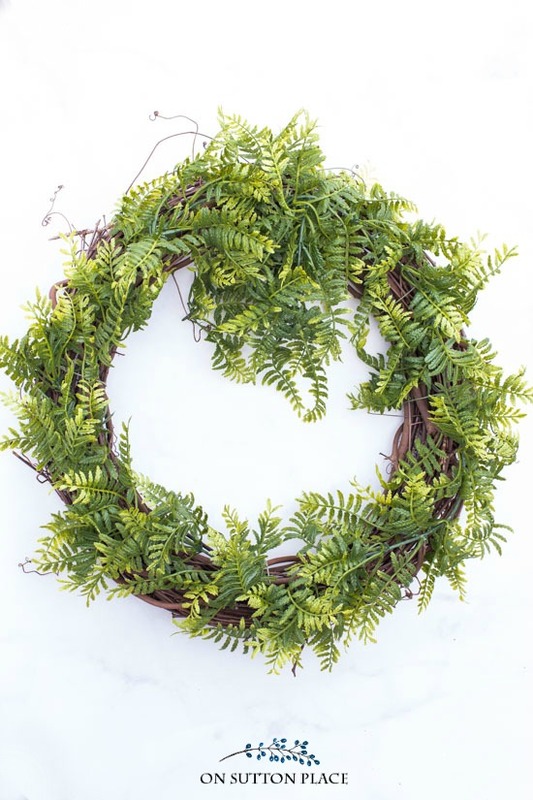 The wreath is so textural and has so much dimension, it’s hard to believe you didn’t use live ferns and daisies. Another fabulous wreath in your collection! Oh Ann, you always come up with the most delightful ideas! Most importantly, you act on your ideas. Love seeing everything you do. Your home is welcoming from the front door and throughout. Wish we were neighbors… I’d be knocking on your door for encouragement to get busy. Happy Spring!! I love the combination of the ferns and the daisies. Very nice. Thank you for the daisy wreath DIY. So pretty. Your inspiring me with all your beautiful wreaths. I like the brightness of the daises and the ferns against the dark door. Love it! So cute and fresh looking. Perfect for your (my?) front porch!! I love the daisy wreath. I will be making one tomorrow! I brought the door mat from Amazon and I hope to make the daisy wreath. Ann, thank you for all your DIY inspirations. Very impressive! I love the wreath! I never thought I was talented enough to make my own wreath. However, by showing the stage for each step, it looked very doable. I’ve wanted a pretty, perky wreath for spring and this is lovely. Also, I liked your doormat and I probably would of thought it was too bold for me, but I found it to be very inviting! Excellent job and I’m envious that your earning your living by blogging. Seems like a dream to get paid for doing something you love, stress free without a time clock or grumpy boss…enjoy! Another beautiful wreath Ann! My I ask how many fern garlands you used and how many daisy bushes you cut apart? You are an inspiration…. Hi Wendy! I used one fern garland and 3 daisy bushes. Enjoy! I love the Daisy Wreath! Especially the fact that it “moves”! I love it! Now I need to freshen up my porch, and I really need a new doormat! This is such a classic look, I love it for its balance and simplicity. I have just updated my wreath that I made a couple years ago based on one of your wreaths, Ann (the one with baby breath, a nest, and a burlap bow). I loved that wreath but it nothing lasts forever. I left the baby breath as a base and added some petunias. I posted a picture on my FB page. Thank you for the inspiration! This is the prettiest wreath I’ve seen in a long time and it definitely is on my project list. Is the fern real? If so how long will it last? “For not really knowing what I was doing,..” I laughed out loud at this. :-) You are too cute! 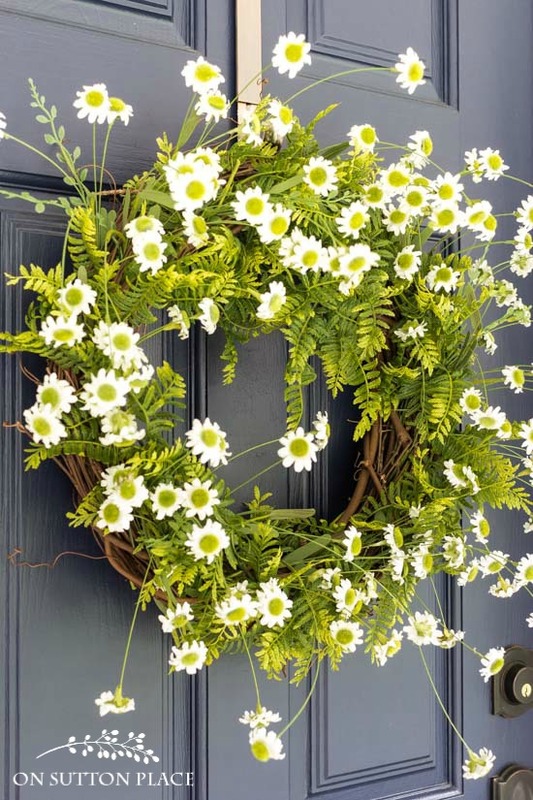 I Love the simplicity of your fern and daisy summer wreath!! I think that will look beautiful on my red front door! Very pretty! You certainly have an eye and talent for creating wreaths! Love your fern and daisy wreath. I might just have to steal this idea from you, as I am in the process of doing our front porch! Thanks for the idea? Such a pretty wreath, Ann! I love it! Daisies are such a simple but pretty flower they are my very favorite. I love your front porch you always make it look like someplace i would like to set and visit. Very nice. It’s fresh and current. I think a bow would have been too sweet and dated. It’s nice to see the movement away from a bow on everything. Nice welcome to your lovely home. Hi Ann, your front door color is so pretty…am I seeing 2 different doors? a grey and a blue? Would love to know the names of the color(s)? No it’s the same door. I took the straight on shot in the sun so the lighting was very different from under the porch roof. I included a link to my paint colors in the post but here it is again: https://www.onsuttonplace.com/2017/01/on-sutton-place-paint-colors/ I hope this helps! I look forward to your posts, and this daisy wreath was no exception. I love daisies! I have the daisies now, & all I have to do is go to Hobby Lobby with my 40% coupon tomorrow & finish it. I adore daisies and this wreath is awesome! Love that it isn’t so rigid and that the daisies stick out in all different directions. Looking at it just makes me happy. Great job. Daisies are one of my favorite flowers and your wreath looks great!! THIS is going to happen at MY house today !! What a lovely wreath!! Don’t think I’ve ever seen a fern garland; definetly going to have to keep my eyes wide open for that!! Such a quick easy piece that didn’t take much time at all. Absolutely beautiful along with your planters and ferns. Thank you for your ideas. Looking forward to the day you reveal your inside makeover. This is one of my all time favorite wreaths too :) I think I’m going to try this one! Thanks for sharing. You’re welcome Jody…hope all is well! Love the tabletop Flower and Garden bucket. Do you remember where you found it? I got it at a large home store called At Home. I believe it’s a chain and used to be called Garden Ridge. Not totally sure about that! Thanks Ann…always love your ideas! Love the extension of the daisies! You have a knack! Love this! Nice and fresh looking…this just may be my next project. This wreath truly says “Summer!” Simple, pretty, uncomplicated, happy! Thank you for the “how-to” – it’s so nice (and helpful) when you walk us through the process. I love the wreath. It is exactly what my front door needs. Thank you once again. It looks perfect Ann. I love the ferns and daisies together. So refreshing! You just keep giving me new “imaginings” all the time. Thank you for sharing all of your artistic projects and great ideas. I may just become a decorator yet! (thanks to you) giggle. Love from TN. Love your wreath, simple, yet elegant. Beautiful, simple and economical. Thank you for all your great ideas. Love it!! Your porch spring cleanup inspired me!! Thanks!! I power washed all the winter dirt, and rearranged my furniture- now I’m looking for a new rug, and planters with more impact,the ones I had are too small-I’ve been grouping different sized pots-but in the hot summer months, they get too dry-I think the big planters like you have are the best solution???? Cute wreath. The daisies give it added colour and another dimension..just like u said.???? I love your wreath! It combines my favorites, ferns and daisies :) It’s past time for me to change out my wreath and this is so fresh and pretty. Thanks for the inspiration! The daisy’s are the perfect touch. Ann you are Queen of the wreaths! It’s so nice against your blue door. Love your ferns- not sure if they would last outside here in England. Wish you were my neighbor ! I’d love to see all your projects is live action !!! Love everything you do !! I’m not very crafty, Ann! But your DIY’s make it so simple. I love blue and yellow together. Your daisy wreath pops with your blue front doo and your other excessories. It certainly screams summer! I feel like I can do this. I have double doors on my front porch. The inlay is glass & rod iron. The outer edges are painted a deep purple. It may sound horrible, but they look beautiful against the body of the house which is painted sawdust. (Which looks green when the sun hits it). Can you give me some suggestions on the color of the flowers? You really good at this! Hi Nancie…I would definitely avoid red or yellow. Anything neutral would work like white or off-white. You could also try a lighter shade of purple or perhaps pink. That might look lovely. Good luck! Quick and easy. I love it! Just lovely! And done for the summer. Love, love, love your light and airy daisy wreath! Easy to replicate for my under roof patio or my front door!!! You always have such fresh ideas that fit perfectly with my decor!! Thank you for sharing your creativity with all of us! This looks so nice! I love the wreath and the doormat. Looking forward to seeing the rest of the porch. I am also looking forward to seeing the big reveal!! You don’t have to be all the way done to give us a look:) I know I will love it. I like how you use garland and cut up flowers bushes to make your wreaths. 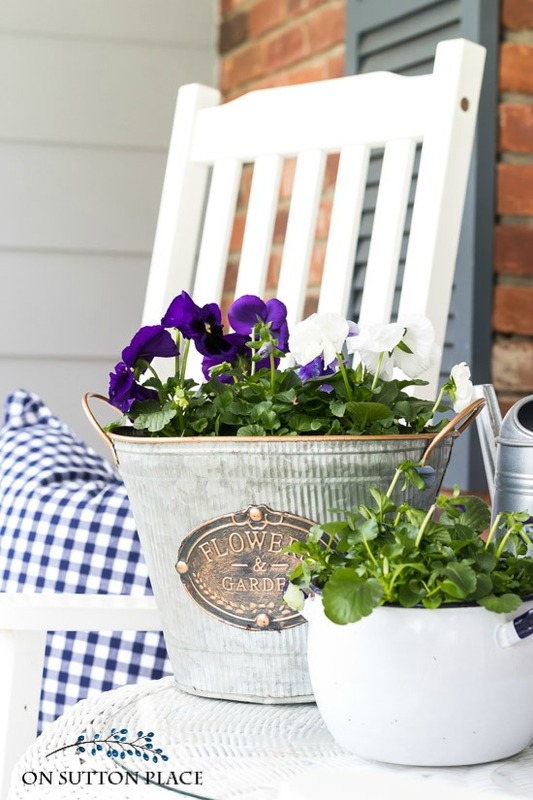 Your porch is already looking lovely for summer:).